This is for Alicia of Funny Face Beauty. She's having a Dare to Wear Charity Challenge to raise funds for Japan. For every person who accepts this challenge, her family will donate $10 to Japan through The Canadian Red Cross. Well Alicia, I'm sure an angel somewhere is smiling upon you. Because of you, some people in Japan will have a warm bed and a filled tummy. For my entry, I'm using the colours of Japan's flag, Red & White. And there's a tear for all the people lost during this horrible disaster. If sad is not your thing (you should be, okay! ), here's a brighter one. 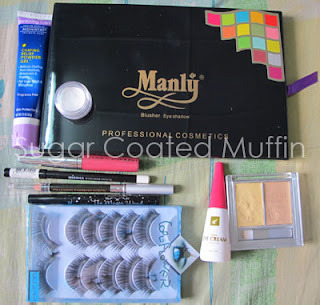 Products used : Monistat Chafing Relief Powder-Gel as primer, Physician's Formula Concealer, NYX Jumbo Eye Pencil (Milk), Powder, Water, Manly 80 Colour Eyeshadow Palette, I Nuovi Lip Polish (Tulip), Missha Eyeliner (White), Daiso Eyebrow Pencil, Beautilicious Eyeliner & Falsies from night market. 1. Primed like crazy cos what I'm putting on my face is really bad =_= Recommend using proper 'white foundation(?)' as powder is drying. 2. Overconceal flaws (seriously). Apply NYX JEP (Milk) as white base. 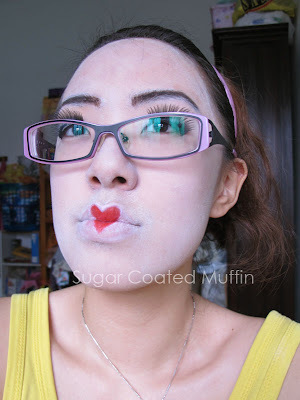 Mix body powder with water and slather all over face. Wait til dry then smoothen with hands. 5. Glue falsies upside down on lids. Take note that they are glued on my lids, not my lash line. 6. 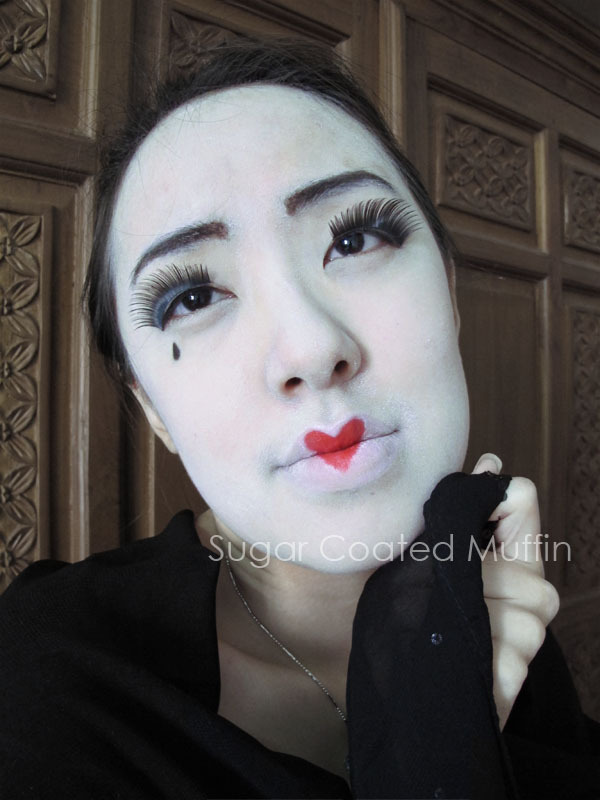 Draw tear using felt tip eyeliner pen. 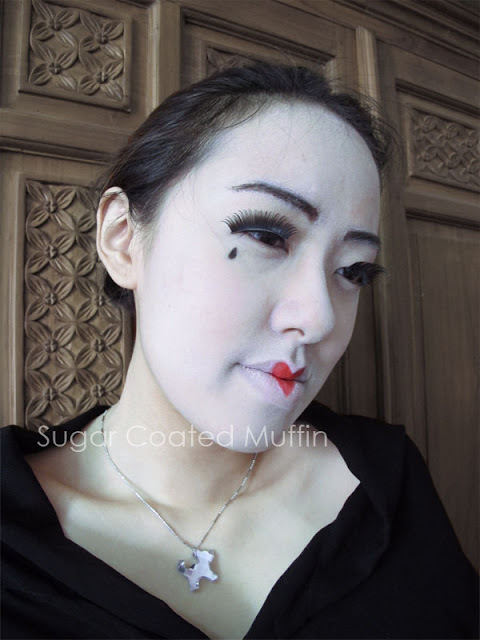 Outline tear, heart & brows with white eyeliner. 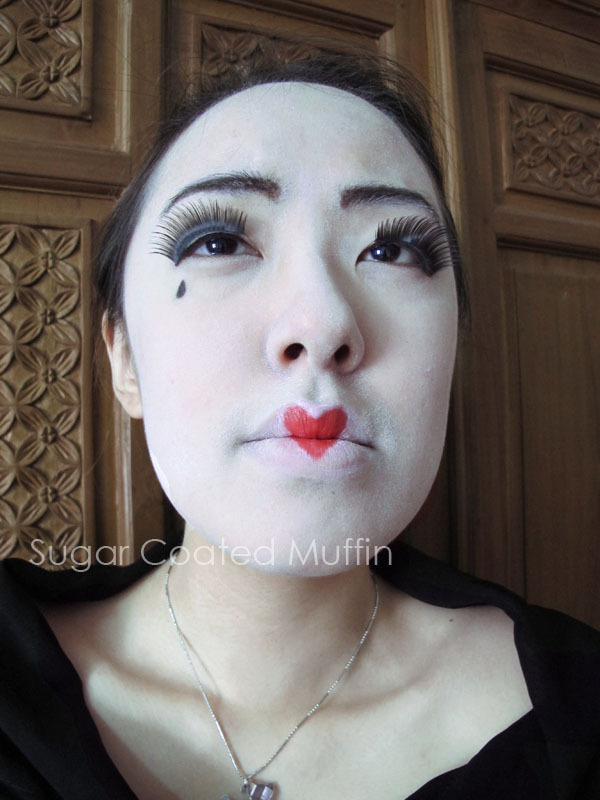 * Geisha INSPIRED look. No offense to real geishas out there. Do your part and help Japan by accepting this challenge! Haha prob not, Anna. I'm sad but at the same time not helping =_= So helping indirectly now. This is great! I love the lips...I need to do that sometime (for a look, not to wear out in public...lol). I love your creativity. Thank you so much for taking part in this challenge. I really appreciate it. This is so cool! How long did it take you to do this? ?